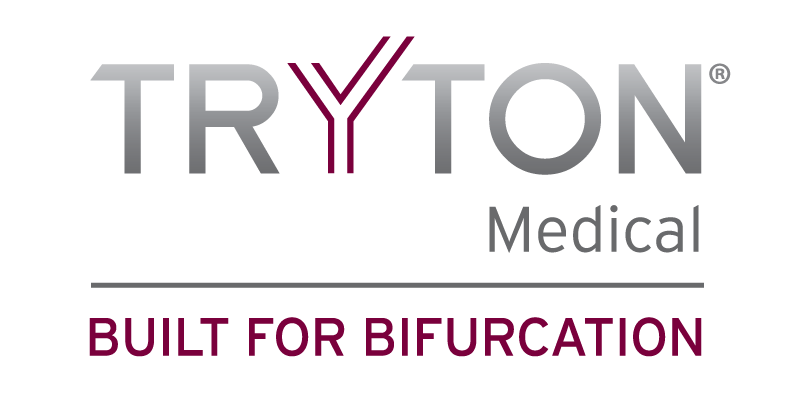 Durham, N.C. – January 24, 2018 – Tryton Medical, Inc., the leading developer of stents designed to definitively treat bifurcation lesions, today announced that the first patient has been enrolled in the post approval study to evaluate the Tryton Side Branch Stent System™ for the treatment of coronary artery disease. The first case was performed by R. Lee Jobe, M.D., a partner of Joel Schneider, M.D., principal investigator of the study, at North Carolina Heart and Vascular, part of UNC REX Healthcare in Raleigh, N.C.
Coronary artery disease often results in the buildup of plaque at the site of a bifurcation, where one artery branches from another. Current approaches to treating these lesions are time consuming and technically difficult. As a result, the side branch is often left unstented, leaving it vulnerable to higher rates of restenosis, the re-narrowing of the stented vessel following implantation. The Tryton Side Branch Stent System is built using proprietary Tri-ZONE® technology to offer a dedicated strategy for treating bifurcation lesions. Tryton’s cobalt chromium stent is deployed in the side branch artery using a standard single wire balloon-expandable stent delivery system. A conventional drug eluting stent is then placed in the main vessel. The Tryton Side Branch Stent has now been used to treat more than 12,000 patients worldwide. It is commercially available in multiple countries within Europe, the Middle East and Africa, and is approved for use in the U.S.